A Few weeks ago One of my friends arranged a wine tour for his wife’s 40th birthday party. The whole day was a blast minus the traffic and running out of ice for the Arnold Palmers Special Ice Tea. 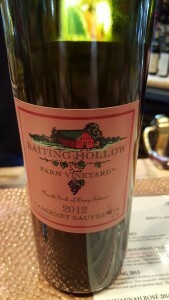 The most notable and memorable part was the Baiting Hollow Farm Vineyard Wine Tasting . (There may have a few other alcoholic beverage tasted prior too and after which may or may not have limited my memory of the day). Baiting Hollow Farm Vineyard is very interesting to say the least the location is fairly large and has multiple separated areas. Each area functions that ranged from live music to food. Most importantly lots of seating space. Each person was given 4 tickets or “Tastings” . I doubled up to a premium on one of my tastes. 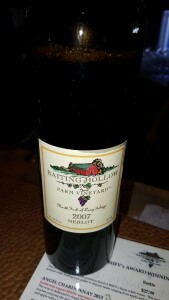 I dont remember which one it was but my tasting included the Merlot 2007, Cabernet Sauvignon 2012 and Cabernet Franc 2012. This Merlot exhibits aromas and flavors of black cherry, blackberry and plum, underscored with slight accents of smoke and vanilla from the oak. The palate is rich and structured with sufficient but mild tannins and a long, lingering finish. It has bottle-aged gracefully and will continue as such for countless years. Cabernet Sauvignon’s richness is first noticeable in its deep red color. It offers up similar richness to the taste with its dark fruit aromas and flavors of black cherry and black currant with dark chocolate. Accents of coffee and smoke can be attributed to the oak influence. The tannins are subtle and firm, giving this wine great structure and superb aging potential. Cabernet Franc is softer and fruitier than the Cabernet Sauvignon and its earthier character consists of tastes and aromas of cherry, blackberry and vanilla with an herbal, white pepper and bramble fruit aroma. 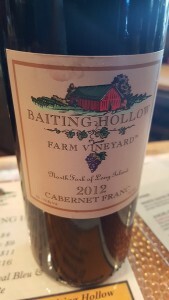 The tannins are soft and gentle, and the finish is smooth with a rounded palate.